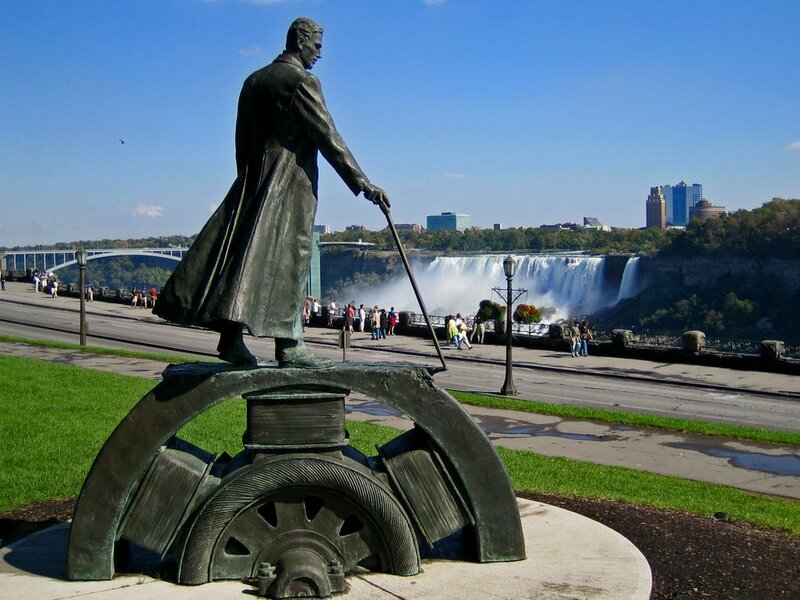 As a boy Nikola Tesla dreamed of harnessing the power of Niagara Falls and turning it into electrical power. Later in his life he achieved his goal of building giant generators under Niagara Falls. He was the first to do that and he EXPLORED new ways to generate electricity. His EXPLORATION led to the modern trend of producing energy in an environmentally friendly way.
" Because Tesla invented the hydro-power system... he is the most important person of the last 150 years for slowing down global warming. If he hadn't come along we would have been stuck with tens of thousands of small local coal operated power stations. There were 3,000 already just in the Northeast when his system put in at Niagara made them obsolete." — Personal Student Interview with Marc Seifer, author of Wizard: The Life and Times of Nikola Tesla, Biography of a Genius.
" There is no subject more captivating, more worthy of study, than nature. To understand this great mechanism, to discover the forces which are active, and the laws which govern them, is the highest aim of the intellect of man." — Nikola Tesla in a speech in front of the American Institute of Electrical Engineers, 1891.
" I saw my ideas carried out at Niagara and I marveled at the mystery of the mind." — Nikola Tesla,1919, in his autobiography My Inventions​.
" My paramount desire today, which guides me in everything I do, is an ambition to harness the forces of nature for the service of mankind." — Nikola Tesla, 1934,​Modern Mechanics magazine. Source: From a paper "The Installation of the Niagara Falls Power Company," presented by Charles F. Scott at the Engineers' Club of Philadelphia, April 17, 1897. In Edward Dean Adams. "The evolution of electric power from the discovery of Faraday in 1831 to the initial great installation of the Tesla polyphase system in 1896 [at Niagara Falls] is undoubtedly the most tremendous event in all engineering history." ​— Charles E Scott, past president of the AIEE. From Electrical Engineering, August, 1943 (Vol. 62, No. 8), pp. 351-355.